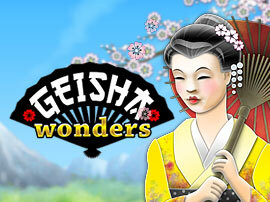 If it is progressive jackpot slots that you are seeking out and want to play online then the Geisha Wonders slot is going to be a slot worth checking out and playing! You will however need to find an online casino site that has it available and on offer, and that should be easy enough as this slot has been designed and launched by NetEnt, so most instant play casinos using their range of games and their gaming platform will have it on offer. Now, as regards to the playing structure attached to this slot it is firstly a multi-denomination slot and as such you can play it for both low or high stakes and everything in between, and it is a slot that also offers 30 optional pay lines! Below is a roundup of how you can win the two progressive jackpots attached to the Geisha Wonders slot game and we will also how you how you can trigger its bonus game and what that bonus game actually is too! As you will see if you look at the screen of the Geisha Wonders slot there are two different progressive jackpots you can win, and to win either of them you will need four or five of the overlaid Star symbols lining up on an activated payline. You can win either of those two jackpots on any spin you play off however there is something of an increased chance of you winning one of them when you play this slot for higher stake amounts. Whenever you do send a base game spin into motion when playing the Geisha Wonders slot game you have the chance of triggering a set of free spins, and to do so you will have to get three or more of the scatter symbols landing anywhere in view on the screen. Three of the scatter symbols will then award you with a set of 10 free spins, four of the scatter symbols in view awards additional free spins and you will be awarded with 20 of them when you do get four scatter symbols anywhere in view and to get to play off 30 free spins all five scatter symbols must spin into view. During the free spins bonus game all winning combinations formed with the exception of the progressive jackpots will be doubled in value and three or more scatter dropping into view awards another set of just 10 free spins. Before we looked more closely at the design of the Geisha Wonders slot game we thought it was a fairly good slot to play, for with the bonus games on offer coupled with the fact you could win one of two progressive jackpots it did tick a lot of our boxes on our checklist of what makes a slot playable. It was however when we discovered the payout percentage of this slot that we marked it down as a slot you should never choose to play for longer than just a few spins, for the long term RTP of this slot is appallingly low at 93.10%! The only time we would therefore advise you to play this slot is when the jackpots are way higher in value than they have ever been before, for when they are very high in value they may just be about to be won. Playing a slot with such a low RTP over a long period of time will see it sucking the life out of your bankroll which is something no slot player will want to see happening or ever experience!